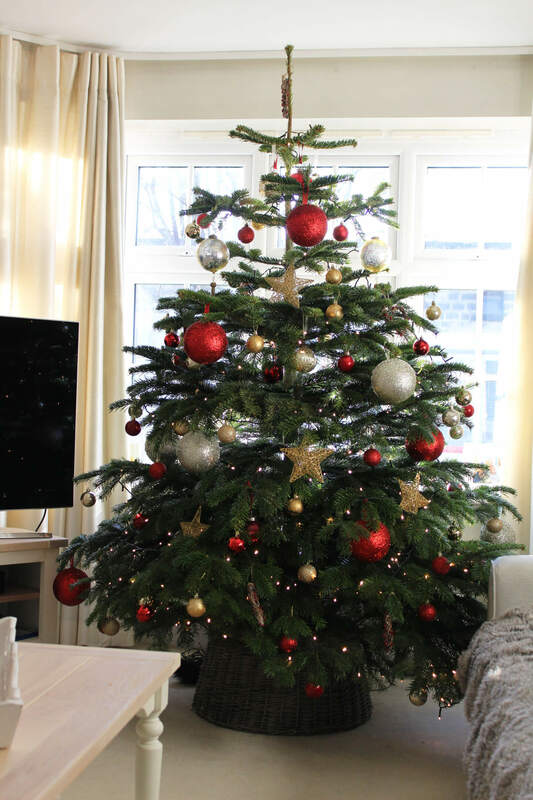 Since moving into my own home, just under four years ago, the 1st December marks Christmas. Christmas decoration time is a go! My mum always liked to wait to decorate until the first or second weekend. This was so we could decorate the house together, so it’s still a novelty to me to start on the 1st. Andrew and I visited a local farm after work to pick a real tree. Another novelty to me, as since we moved in, we’ve had a fake tree. It was so exciting pulling out all the trees, deciding which one was best. The difficult part was obviously getting it home! 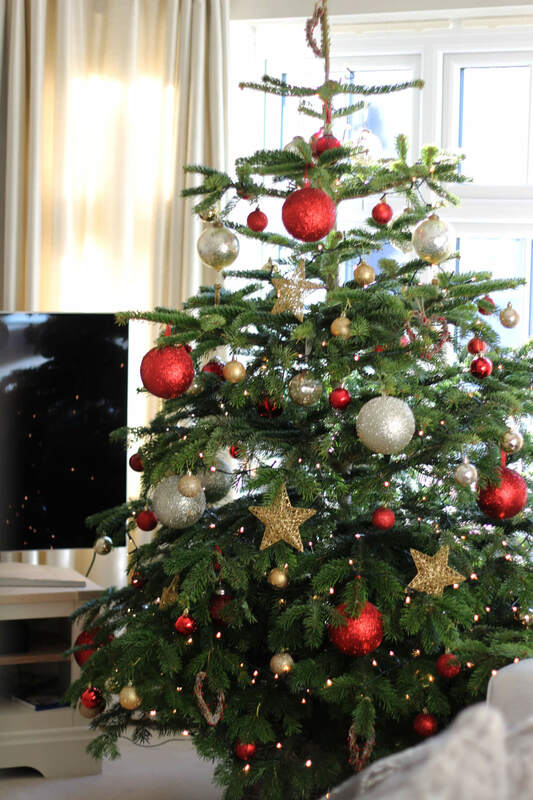 I always style my Christmas tree with red and gold baubles and decorations. It’s very traditional and the colours just symbolise Christmas to me. I may be a little Monica (from Friends) when dressing the tree, but I do try to reign it in and let Andrew have a go. I can always move them when he’s not around. Another first for this Christmas has been having a Christmas bouquet. 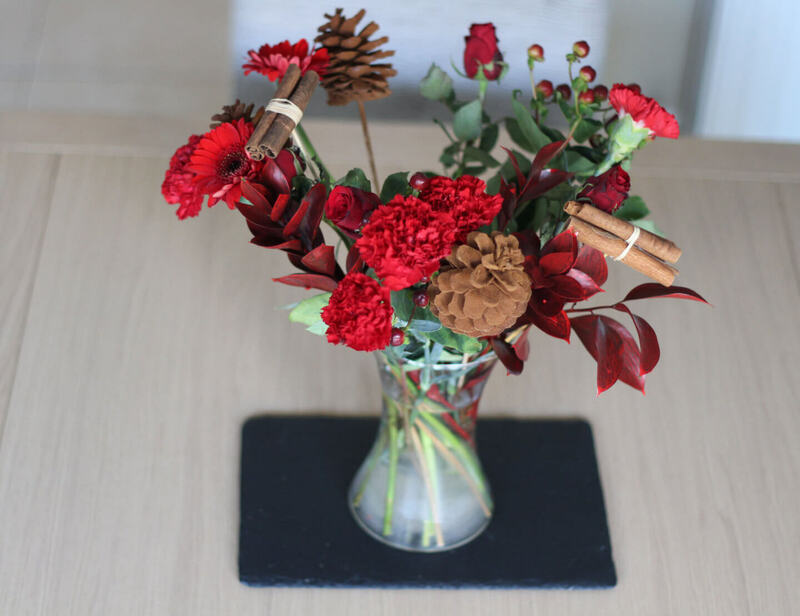 A bouquet styled with cinnamon sticks and pine cones. Cinnamon and pine are the two scents that remind me of Christmas, therefore this bouquet from Prestige Flowers* is perfect. The bouquet arrived fresh in a box to work. The flowers were in perfect condition as they’d been well packed, and clearly well handled during transport. I loved the mix of scents from the fresh flowers and the cinnamon. Inside the packaging was also an unexpected box of chocolates. 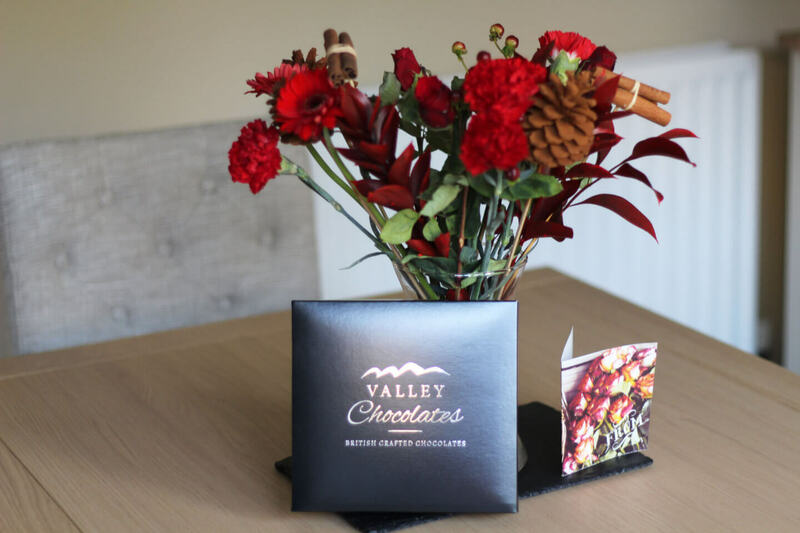 This bouquet and chocolate combination would make a wonderful Christmas gift too. The flowers still look as fresh as the day the arrived, even five days on. I plan on keeping the cinnamon sticks and pine cones for future bouquets too. They’ve definitely jazzed up my new dining table, which I’ve been looking for a centrepiece for. 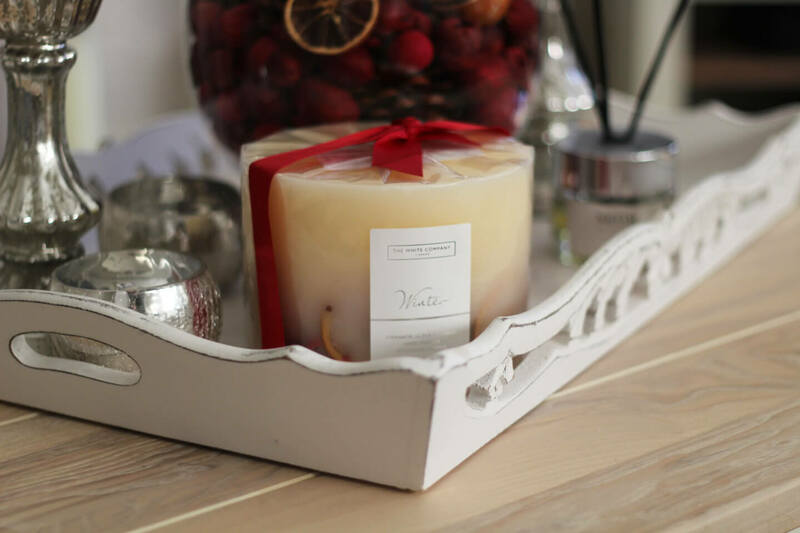 Every year, without fail, I buy either the pot pourri or candle from the ‘Winter’ collection at The White Company. This year I went with the Winter Botanical large pillar candle. I’m yet to open the packaging as I’m keeping it for a cosy night in with my husband, which will hopefully be tomorrow night. The candle looks beautiful on my coffee table tray. The only time I ever have pot pourri in my house is at Christmas. 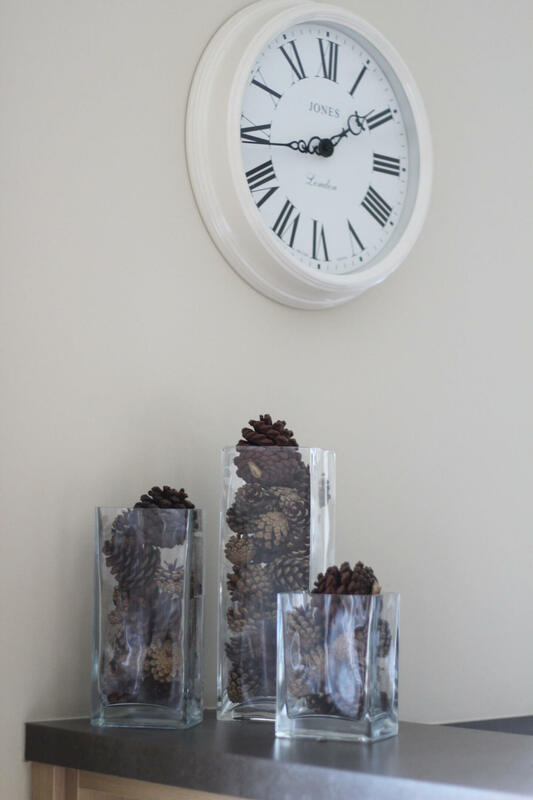 At our local Farmer’s Market I found a bag of scented pinecones, which I placed in three different sized vases and have displayed on my breakfast bar. I think it’s simple but effective. It also brings a little Christmas into the kitchen. 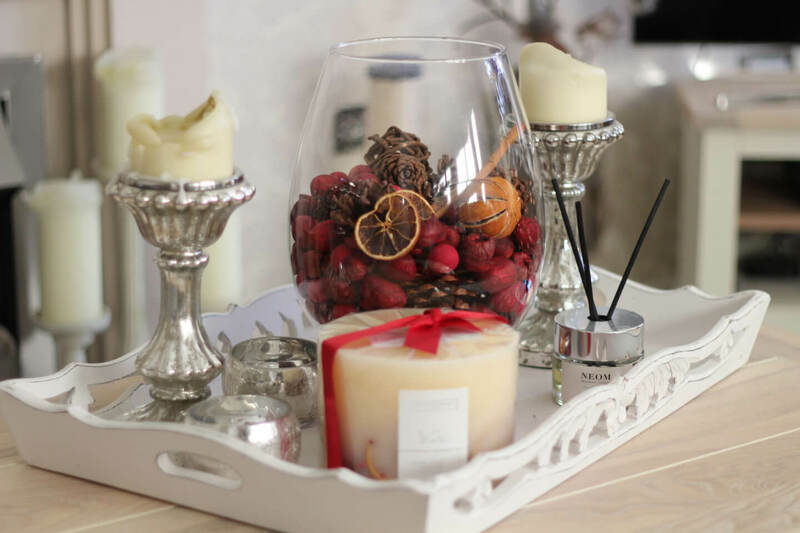 I’ve finished off my coffee table tray with a vase full of Next’s Festive Spice pot pourri. The scent isn’t overpowering, unlike some other brands, and just adds a subtle fragrance to the air. I’d definitely recommend it if you don’t like anything too strong. It’s all about the aesthetic appeal for me too. I didn’t actually arrange it either, just tipped the bag into the vase, et voila! So there you have it, how I’m styling my home for Christmas. Do you have a similar post? I’d love to read it if you do, so please leave a link! *Prestige Flowers sent me their Christmas Bouquet and Chocolates in return for a review, however all opinions are honest. Great post Lauren! home decorations for me typically include the Christmas tree, lots of tinsel and cinnamon and vanilla candles! Thank you 🙂 Oh Vanilla candles; delicious!